Description: Defiance Knives is owned by Mastersmith Michael Rader, who brought his exceptional design and knifemaking skills to this project. Defiance Knives combines modern manufacturing techniques with hand grinding and finishing and uses high performance materials. This Defiance fixed blade is all about performance. 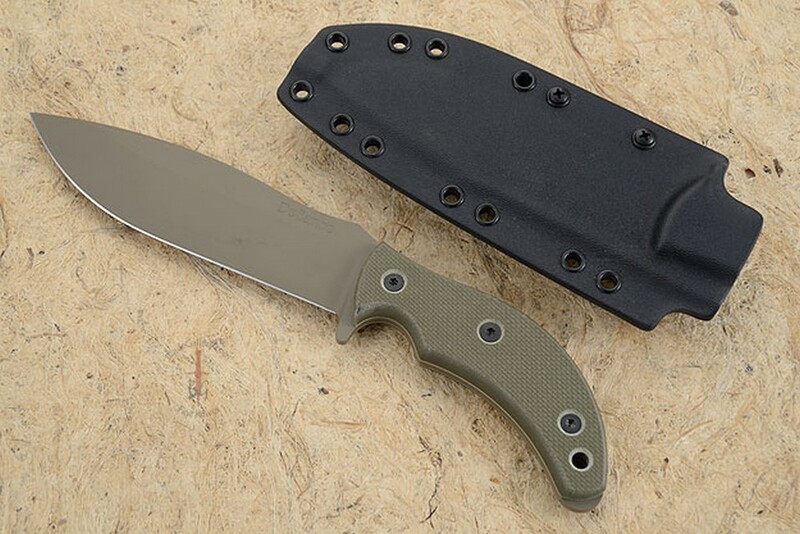 Michael chose CPM3V carbon steel for the blade, which is a crucible steel well known for its impressive edge retention, some corrosion resistance, and tough-as-nails attitude. CPM3V is made by the Crucible Particle Metallurgy process. It is designed to provide maximum resistance to breakage and chipping, and offers impact resistance greater than A2, D2, or CPM M4. The blades were heat treated by Peters Heat Treat Inc. in Pennsylvania. They are the world experts in heat treating CPM3V and the results are astounding. They hardened it to Hrc 61 for a combination of durability and edge retention. 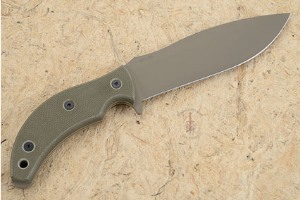 The blade is finished with non-reflective, rust resistant tan Cerakote. 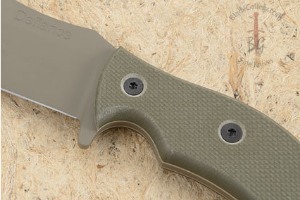 The knife is full tang, yet it retains a nimble and lightweight feel. The handle is comprised of green G10 scales, secured by three bolts. Contouring and beveling along the edges creates a very comfortable grip, while side checkering offers a tactile, no-slip purchase. A finger choil and the blade guard assist with this as well. The tang extends just beyond the G-10 handles, and can be used for impact or light hammering. The handles are completed with a lanyard hole. An excellent first endeavor for Mastersmith Michael Rader into the mid-tech tactical world. A simple, yet performance-driven and proficient tool ready for serious use. 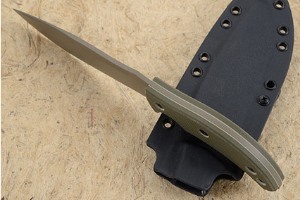 The knife is accompanied by a custom made Kydex sheath by Eric Lind. 0.03515625 0.01953125 35.15625 19.53125 Header Started.